This website has moved back to its own hosting. It’s now at https://ArtistsJournals.com, with new & updated content. See you there! Author AislingPosted on 17 January 19 21 January 19 Categories UncategorizedLeave a comment on MOVING! As an artist and as someone who keeps a visual journal, I think they’re two different things. For me, an artist’s journal is an illustrated diary or journal representing the artist. It’s about the person’s life, or some aspect of it, such as a travel journal, a diet & fitness journal, or something like my ‘decluttering journal’. It usually includes art and the journal is also a work of art, in itself. 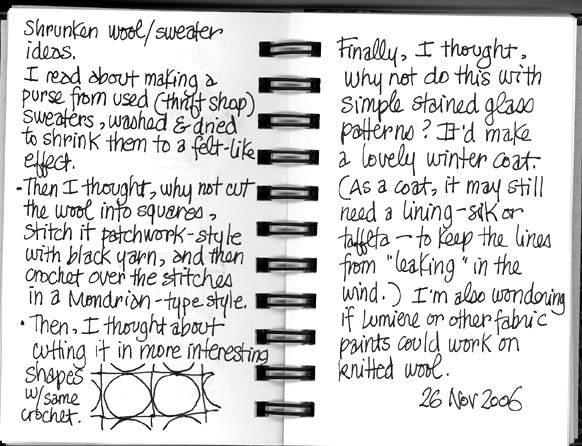 Below, you can see a page from one of my 2002 artist’s journals. It’s a collage I created when I was coping with an impending divorce. The original is about 6″ x 9″. By contrast, an art journal is where I keep notes about art I’m working on or might want to create later. It includes visual inspiration — photos, articles, etc. — as well as my own thumbnail sketches, etc. At left is a page from one of my 2011 art journals. The page included photos from a magazine. On that page, my pencil sketch shows my initial thumbnail concept for a later painting. I use an art journal as my on-paper memory of inspiration and original ideas. It’s sort of like a visual thumb drive of art ideas, for later use. Here’s a typical sequence: I started by surfing the Internet to see what other artists are currently working on. Yesterday, I viewed a website called The Starving Artist’s Way, which included a project using second-hand woolen sweaters that had been washed and dried to shrink them in a “felted” style. I didn’t think much more about that — not on a conscious level, anyway — but later in the day, after a nap, I woke up thinking about what else I could do with that kind of wool. This merged with the Mondrian art that I was reminded of when I was playing an online game, Kingdom of Loathing, yesterday. So, I’m scanning the pages from my idea journal, and putting them into an art zine for two reasons. First, it documents that it was my idea. It drives me crazy when I decide to run with an idea and it turns out that another artist has been working on a similar concept… and people think that one of us is “copying” the other, when we’re not. Second–and more importantly–I am sharing this idea so that someone else might be inspired by it and adapt the concepts (or copy it line-for-line, for all I know/care) to his or her own art. Note: When my grandfather’s original ideas were copied, he used to chuckle and say, “Plenty more where that came from.” In other words, he didn’t feel any need to complain about those who copied him. I’ve always liked that, and he was the richest man I knew, when I was growing up. He literally made millions (when that was a lot of money) from his creative ideas; he was a good role model. But, I’m also sharing my art journal pages so that people see what one can look like. However, these may be my own definitions. How you use the terms ‘art journals’ and ‘artists journals’ may be different… and that’s fine with me. The creativity that matters more than the words! Saving collage photos, papers and ephemera… it’s always a challenge. But, I’ve found a system that works well for me. It might help you, too. I save my collage elements — especially magazine photos — by color, in manila folders. I start with the major color groups (red, blue, green, etc.) and then expand (lime green, turquoise, etc.) as my collection of saved images becomes too large for anything simpler. All of my manila folders are stored in one large, flat old-fashioned artist’s portfolio thingie. You know, those huge black folders made from heavy cardboard, covered with a black, textured surface, and they tie at the top and sides with cotton tabs. I’ve tried many organizing systems for my stacks of wonderful papers and collage images. This has worked the best for me. 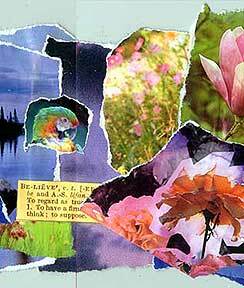 A composition book art journal is any journal that’s kept in a composition book. Those are generally school-type, saddle-sewn (along the crease) notebooks with cardboard covers… similar to exam/test booklets, but a little more permanent. Composition books are inexpensive, so many people like them especially for informal journaling. It feels less intimidating to use a journal that doesn’t cost much, and is familiar from our years in school. They’re so affordable, you can buy several. Composition books have lots of lined pages in them… as many as 100. They come in a variety of sizes, but the traditional ones are about 8″ x 10″ or so. The traditional ones often have a b&w cover that looks sort of marbelized. You can use any page in a book like fabric (to sew on, for example) by using iron-on interfacing on the back side of the page. Yes, just iron it on, the same as you would iron interfacing onto fabric. It won’t always stick 100%, but it will work well enough that you can sew through it. At left, you can see one of my journal covers that I’ve embellished with sewn-on buttons. The biggest button is part of the journal closure. When it’s not in use, a string of hemp (secured to the back cover) is wrapped around the button on the front cover to hold the journal closed. After you’ve finished your sewing (or other embellishment), you can glue a page or fabric over the ironed-on interfacing, so your stitches are concealed. If I’m doing a lot of this in a book, I’ll buy a second copy of the same book, so the “backing” page is what it would have been, if I hadn’t covered the original with interfacing. You can also iron on Stitch Witchery or another fusible adhesive, and that gives you the option of sticking something wonderful on the other side… interfacing isn’t all that interesting. For example, you could fuse an actual piece of fabric to the paper page. Then again, after I sew beads onto the page, I like to cover the interfacing side with more paper… maybe a collage. You can sew onto your journal pages, or turn them into fabric. It’s easy! Artist’s journals are illustrated diaries and journals on any theme. An artist’s journal — or art journal — can be a record of your daily thoughts, a travel journal, an exercise or diet diary, a dream journal, a place where you jot down your goals or to-do lists, or… well, almost any record that you’d like to keep in a book or notebook. They become “artist’s journals” when you add any kind of art, illustration or embellishment to the pages. 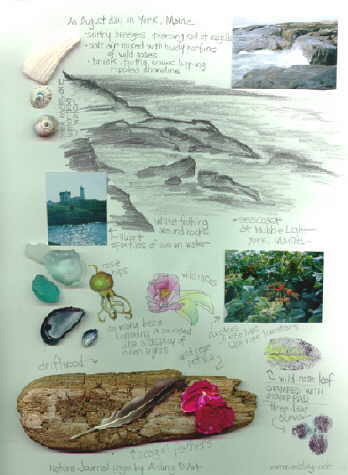 This is a travel journal page I created after visiting “The Nubble” lighthouse in York, Maine (USA). It’s a mixed media work, combining sketches, photos, beach glass, shells, and driftwood from that journey. The original is part of a 9″ x 12″ spiral-bound sketchbook. Author AislingPosted on 23 March 10 29 May 17 Categories GeneralLeave a comment on What’s an Artist’s Journal? The following article is based on one that I wrote around 2005. It’s still a useful tip for anyone creating an artist’s journal. Wax paper can be a vital tool if you’re keeping an art journal. Wax paper can separate damp art journal pages — after they’ve been painted or collaged — so they don’t stick together. You’ll find wax paper at the grocery store, in the aisle with foil and plastic (cling) wrap. In the States, the leading brand is Reynolds’ Cut-Rite wax paper. That’s it in the photo. The package is about the same size as a roll of foil or plastic (cling) wrap. I’ve used wax paper when I’ve gesso’d in airplanes (very dry air) and — at the other extreme — in sultry, humid Houston. If you try wax paper and don’t have much success with it, try gently crushing the wax paper — before you use it — so it holds the pages slightly apart. Note: It’s important to gently crush the wax paper; if you fold it enough that the wax falls off at the crease, that line (or point) may stick to wet paint, gel medium, or gesso. Then, I will separate two pages at the most: The one that I’ve just painted, and the one that I’m currently working on. Because wax paper isn’t 100% non-stick, I don’t want to risk damage. Remember: Less weight or pressure on the wax paper means less risk of sticking. Also, the drier the pages, the better. You may be safe with sheets of foil as separators. Or, consider thin sheets of teflon-coated plastic, sold in kitchen supply shops; they were invented to safeguard very sticky cookies, meringues, and so on. Plastic wrap (cling film) isn’t usually helpful. It tends to stick to paint, gel medium and glue, and some glues will completely melt it. If you have to choose between plastic wrap and nothing between the damp pages, opt for nothing. Really. Some plastic wraps — especially the more expensive kinds — are practically guaranteed to stick to your damp pages, prevent them from drying (ever), and not peel off (ever).